Repurposed Pod hopes to disrupt the cocoa industry through new cacao crop innovations, advancing cacao agriculture and adding value back to the supply chain. We started Repurposed Pod in October of 2014. We launched our first product (100% Cacao Juice) 2 years later October 2016. We have always been in the cocoa industry and spent many years trekking across the beautiful cacao farms. Traditionally, the farmers will hand pick a cacao pod off the tree, crack it open and you pop the cocoa beans in your mouth to taste the sweet fruit pulp which surrounds the bitter beans. It’s always been a highlight to our days on the farm. Some of this sweet fruit pulp is used in the fermentation step of the cocoa harvesting process. However, the rest is simply wasted. We realized we could bring to life this beautiful fruit to the U.S. market and by utilizing this wasted sweet fruit, we could bring additional value to the cacao supply chain, and provide premiums to the farmers through increasing land utility. It was one of those magical “ah, ha” moments we will never forget..
By reinventing the cacao crop’s 3,000 year old post harvest process. Repurposed Pod had the opportunity to provide a new perspective on “the fruit that brings you chocolate.” No longer is Cacao only the crop of cocoa beans, it is also the crop of cacao fruit juice. We measure success against our mission of advancing cacao agriculture and improving the livelihoods of cacao farming families. This is the ultimate success. Starting your own business is ONE BIG learning curve. In the beginning you wear every hat, you learn every role (even roles you may not excel in or roles your not comfortable with). As you navigate the rough waters of a start up remember your mission You embarked on this journey for a purpose, a purpose to help make the world a better place. Remember your purpose and stay true to your mission every step of the way. Let it guide your decisions, let it lift you up when you reach obstacles (because you will!) and allow yourself to celebrate the successes along the way (big and small). We are constantly innovating and brewing new ideas. Let’s just say Cacao Juice is only the beginning for Repurposed Pod. I love to cook healthy foods Monday I made this Thai Chicken with Spicy Peanut Sauce, it was amazing!!! You use peeled carrot as the noodles and sun butter for the “peanut sauce”. The Urban Worm harnesses the power of vermicomposting, utilizing the humble earthworm to provide solutions in sustainable waste management and sustainable agriculture. Since December 2013 after being selected for the Women in Social and Environmental Enterprise program (WISEE) which provided me with a small start up grant and business model support. After completing my MA studies in Human Security and Environmental Change, specializing in Urban Food Security and Urban Agriculture I had to make the decision to either leave my native city (Nottingham) to find employment in my field or create an opportunity for myself and for my city, so The Urban Worm began. Everybody of course has to eat and building sustainable food systems will be at the heart of our ability to thrive in the face of adversity. Climate change, desertification and natural resource depletion are undermining global food security and the current corporate driven, energy intensive, unjust and chemical ridden model is neither sustainable or successfully meeting the nutritional needs of the world. We need to empower a different model that is local, organic and community driven and vermiculture provides the foundations for this movement by producing a superior organic fertilizer and compost. Worm castings are teeming with beneficial microbes essential for healthy plant growth and disease suppression with exceptional water holding capacity, perfect for urban gardens and extreme weather events which we are experiencing more of as a consequence of climate change. The process of vermicomposting not only provides a high value by product, but the process is an efficient, low tech and cost effective system for a sustainable management of organic waste, as opposed to diverting the waste to landfill which further contribute to climate change as gases emitted from food waste are 31 times stronger than carbon dioxide. By managing our waste at home we can make a positive contribution to building the foundations for sustainable societies and vermicomposting can be done on a very small scale, even if you live in a flat you can keep worms in your cupboard, the process is odorless and perfect for indoors. Having the opportunity to travel to learn has by far been my greatest achievement. I was awarded the Winston Churchill Memorial Trust (WCMT) travel Fellowship to research vermiculture in the USA and Cuba, and this opportunity to learn has been inspiring and is wonderful to make international connections with like minded people, building a wider community of vermicomposting enthusiasts, sharing knowledge and passion. As I I write this I am in New York preparing for the next Cuban leg of my research. Whilst traveling the west coast I saw vermicomposting in prisons, zoos, schools, colleges, universities as well as successful businesses, it has been incredibly inspiring and presents a blueprint for developing institutional sustainable organic waste management in the UK. This will be the next achievement, so watch this space. From Cuba the learning will be vast as Cuba is considered to be the global leader in vermicomposting as after the breakdown of the soviet union they lost 80 % of their imports of synthetic fertilizers over night and so a sustainable alternative was called for, and the organic movement began, with worms. Tricky one! I guess on a personal level success is to receive love, which I never feel in short supply of! On a professional level success is having influence to make positive change, locally and globally. That worms definitely don’t like too many apples- I had a massacre situation a few years ago after a community apple pressing day. Sad, sad day, too much acid, a lesson learned the hard way. 7. What advice would you give to someone trying to break into the worm farming industry or simply starting a wormery at home. On return from my WCMT travels, besides catching up with friends and family, and checking up on my worm culture, I will be working on a project that introduces vermicomposting into prisons in the UK. Institutions need to play a key role in practicing sustainable waste management and the USA has some incredibly successful models, notably Monroe Correctional Facility in Washington. Feed the worms, feed the soil, and feed the soul. Whilst visiting my family in New Jersey we went to a delicious Italian restaurant in Glen Rock called Rocca, all local and organic produce. I had a bruschetta to start and spinach gnocchi for my main, perfect! 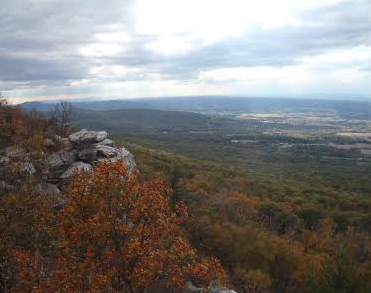 This weekend I set out on a camping trip to South Mountain State Park in Maryland. I’ve never been, but it promised hikes on the Appalachian Trail, incredible views from the mountain, and a nice lake near the campsite. After doing research, reserving a site and prepping my materials, I focused on food. My grandma, being a great cook, saw me chopping up potatoes and asked if I was planning to cook them right away. I explained that this was for the camping trip and that I was chopping them up so as to marinate with onion, olive oil, salt and pepper. She raised a concern and said the potatoes could turn brown when exposed to air, but she was curious to see if my ‘invention’ would overcome this obstacle and let me proceed. Having never prepped potatoes for a hike I had no clue whether the potatoes would last the night. All I had to go on was a sense of adventure and belief in the best. In fact, many of us have such moments, and not necessarily limited to food. Then, I thought deeper and my ideas floated to the past, to our ancestors. Many of these individuals made up their ‘innovations’ and created the ways we cook, preserve and present food today from trial and error. There are many projects that get scrapped and don’t pass the test, but a lucky few do get passed down to new generations. That day in the kitchen I was exploring new ways to prepare potatoes, and I’m happy to say that the potatoes didn’t brown. They ended up being cooked on an open fire on a chilly weekend in the woods, leaving everyone who indulged in them happy, warm and full. In addition, I was able to teach my grandma, who is overflowing with knowledge on cooking, a new skill. This idea of being open to innovation, to making mistakes and embracing uncertainty applies to things beyond the kitchen. In the real life it is easy to stick to regular routines and things we’re familiar with. But, if we don’t explore and be ok with making mistakes then we won’t reach new grounds. For me, my exploration turned to success, yet even from the success I already deduced things I can improve on. 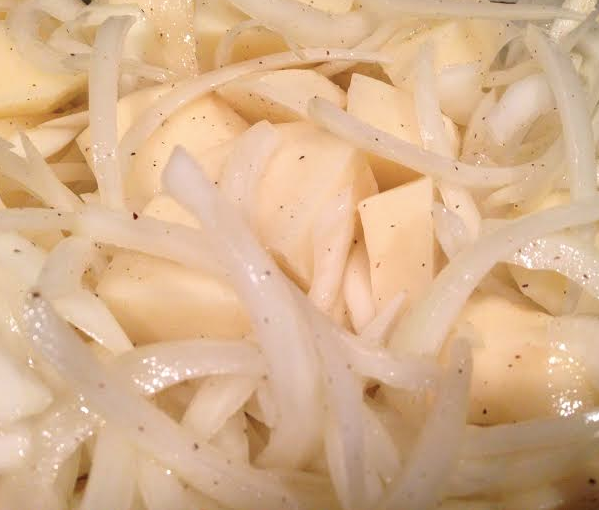 For instance, I realized that chopping the potatoes into thinner slices will help them cook faster and more evenly. I also learned that hotter spices with bolder tastes, such as curry or hot chili, are better ingredients to marinate with. Especially because hiking outdoors leaves you tired and craving comforts of home. Food is always a good reminder of home, so why not make it spicy and hot, especially if it’s cold outside. Also, I will use less potatoes as they are difficult to keep fresh, even in cold weather, and really need to be used quickly, ideally in the first night, or maximum the second, but no longer as they can go bad and start spreading bad odors in the cooler. If any readers have tips on what to pack and prepare for hikes please let me know. Even though camping doesn’t always entail gourmet food, I believe that there is always room for delicious meals, whether at home or in the mountains. The trick with camping is to pack filling, easy to prepare, and easy to carry food. With a happy and healthy belly there is nothing we can’t accomplish. If you want to explore our world you can travel, forge new friendships, experience new events, try extreme sports, or simply take a bite of a new cuisine. What always fascinated me is that despite a small number of basic ingredients, people in various corners of the world have come up with different methods of mixing them to create such an array of dishes with uncommon flavors, textures, and colors. Another thrilling aspect is that each group has its own unique traditions of eating their national cuisine. In Asia individuals rely on the engineering of chopsticks to transport food from the table to their mouth. Yet, still, most of world prefers the use of knives, forks and spoons, as they provide a more secure structure to move food from point A to point B. 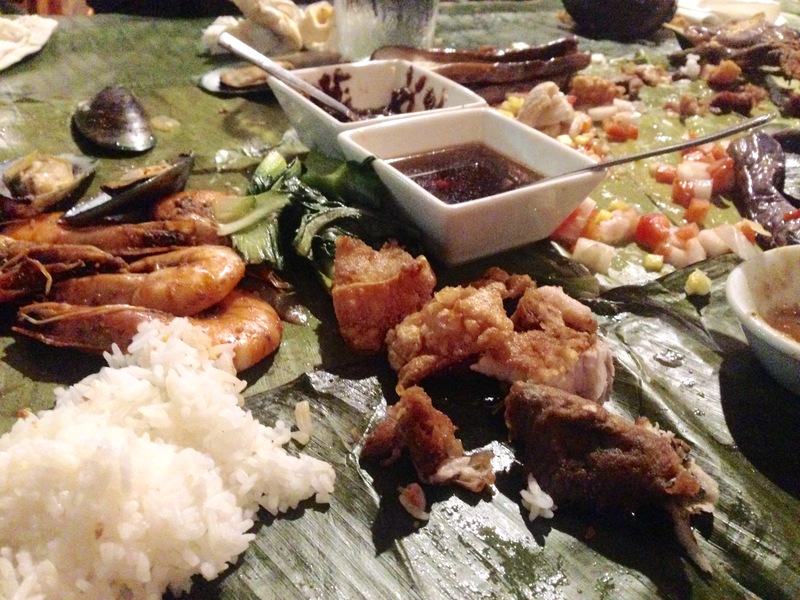 So, when my co-worker invited me to attend a traditional Filipino dinner that would be served on banana leaves and eaten by hand, I jumped at the chance to experience a completely new adventure. The best part was that I didn’t have to travel far to get a taste of a country that is on the other side of the world. Instead, my friends and I drove to a local mall where the restaurant was and got to enjoy a live funk jazz band as we dug into the exotic meal. The assortment of food was spectacular! Cajun shrimp, fried milk fish, pork bellies, vegetable rolls, eggplant and rice (which served as the glue that kept the yummy ingredients together). For dessert we had purple yam and mango ice cream in a bowl with pumpkin, flan, and other delicious sweets that I couldn’t decipher, all cooled on shaved ice. Having lived in the Amazon jungle, I was not a stranger to eating on banana leaves, but the food that was served and the ingredients that were presented to me at the restaurant made a huge difference. In the jungle, there is a lack of spices that bring out flavors of the meal and introduce magical notes to your taste buds. In the middle of the green forest, my lunch consisted of cooked yucca and plantain, dipped in salt (a luxury that my team brought from the city), and a piranha fish soup. Eating the soup with my hands was not easy, especially as I am not good with pulling the bones from a fish bathing in hot water, so I mostly indulged in starch and carbs of the yucca and plantain. So much of what we do, what we eat and how we eat is determined by nature. In the jungles of the Amazon, as communities let go of their nomadic traditions and built communities, a rise in population makes it difficult for everyone to rely on nature. There is not enough time for the hunted animals to repopulate, and that leaves a shortage of food, leading to malnutrition in kids. Living in DC I never had imagined that I would relive the experience of eating on banana leaves, but I did and the food that I tried was simply delicious. If we want to expand our knowledge of the world, learning about our food and trying different cuisine is a good option, especially if travel is not. If you guys have any recommendations about other cuisines and restaurants that are worth giving a try on this gastronomic adventure, please let me know. Until then, I’ll keep looking out for these opportunities and share my experiences with you. If anyone reading this lives in Maryland, you should definitely try the traditional Filipino dinner at Lumpia, Pansit, Atbp. To grow we must challenge ourselves. Take plants for instance, in order for them to reach more sunlight they must go deeper into the ground (the root goes down and the stem shoots up). What about animals? The different species we have of same family of mammals is due to environmental challenges that each group adapted to. Even fruits and vegetables have different varieties. Nature wouldn’t create options if one was enough to address all challenges and fit all needs. As humans we too must adapt to challenges. This is not done by running away, it’s done by facing the problem, studying it fully and finding small solutions until we overcome our obstacles. Here are three TED talks that provide solutions to common challenges of life. Many times we are afraid to make mistakes. This is because we don’t like accepting that we’re not perfect. Sometimes these thought processes lead us astray and not being able to control what comes our way scares us. Yet, if we avoid problems and lead comfortable lives we will never develop. Learning to accept mistakes, face fears and turn problems into lessons will help us grow upwards, just like plants. Once the problem is isolated we try to get rid of it as fast as possible. But like weeds that grow stronger roots, stomping out problems on the surface won’t take them away. Instead, we should look deeper and resolve them from there. For many of us, learning to cook and eat mindfully in our busy lives doesn’t leave us much time to address these issues. One physical symptom of this is weight gain. To address this many turn to extreme diets and then gain the weight right back, but they don’t learn to control their cravings. 3. Set your mind to look for solutions. To accomplish anything we must have the right attitude and really want it. Willpower can get us moving, but it is our passion and emotion that keeps us invested even in the face of challenges. These are the things that make life worthwhile, because we know that attaining the goal will be for our own benefit. Being invested in wanting to change means you’re more likely to do it. And even if things don’t go your way, you won’t give up easily because you will know that development requires trial and error. But one thing you can be sure of is: once you do find the path to change it will definitely be a sustainable and a long-lasting one. In a life that keeps changing we must keep growing. But, before we can run we must walk, and sometimes before we can walk we must begin by crawling, either way – keep going forward. To see more inspiring videos on growth check out this playlist on becoming “A better you“. After all, even the tall tree under the sky was once a small seed buried in soil. Have you ever tried gardening? I haven’t, but my desire to turn a grey deck into a green paradise meant that I had to learn. With a few trips to a local Home Depot, I had several pots of plants adorning my balcony. Thanks to a bit of love, lots of sunshine and few occasional rain showers, signs of green started showing. Small seeds burst open, new sprouts grew upwards crowning themselves with flowers, until crowns got heavier and bore fruit. Thanks to the variety of plants, I learned the struggle of each one and realized they all had a different path to follow. The few weeks spent in the garden have taught me some wisdom and I’d like to share these life lessons with you. In the garden I had a variety of food: tomatoes, strawberries, mint, basil, and even lavender for nice aroma. 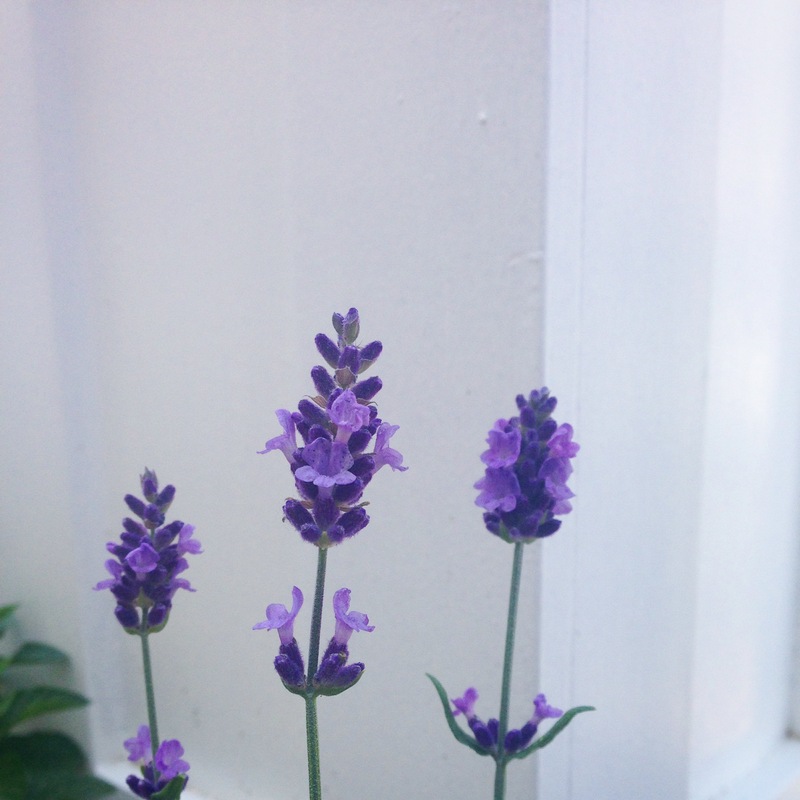 The first to blossom were the herbs and lavender, the fruits came last. 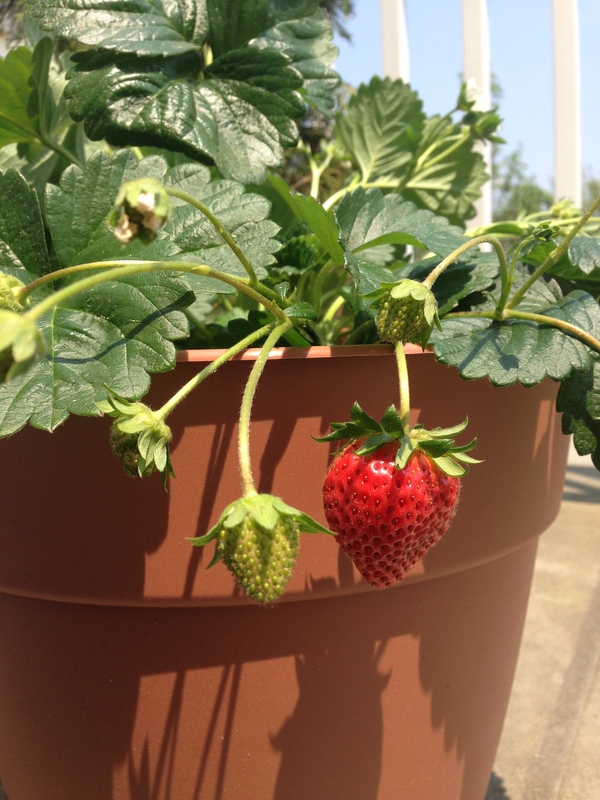 Of them, the strawberry bloomed from different sides, the flowers transforming into sweet red fruits. 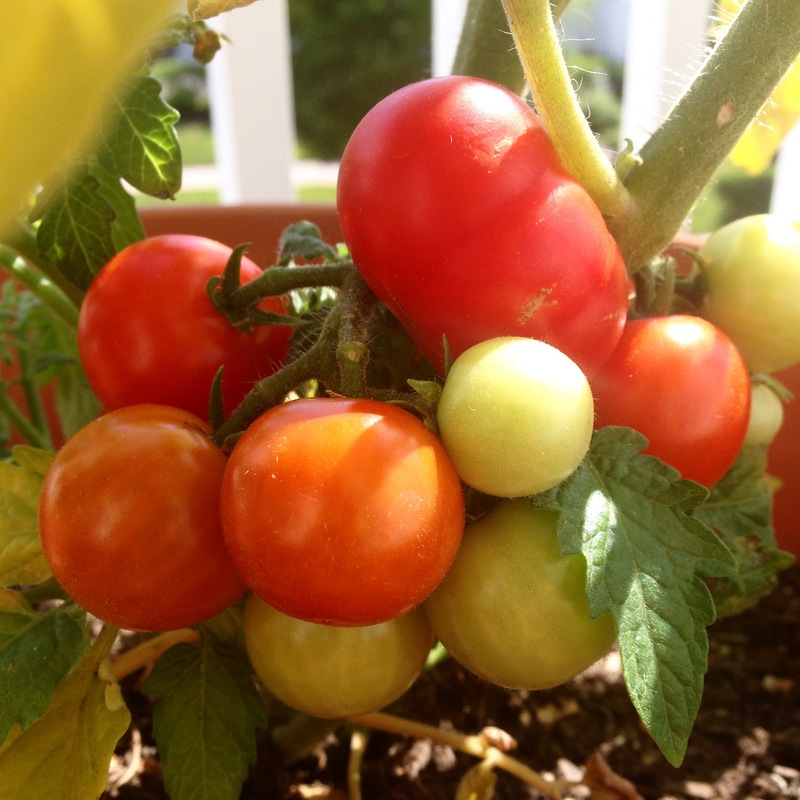 The tomato bloomed and bore fruit in a bunch, but it took weeks before they ripened. We all have different paths to follow. For some the journey is long, but we’ll all get there eventually. The first strawberry to appear on the plant was nice and large (not the store kind of large, but more of the organic type you’d expect the strawberry to be). For days it was basking in the sun, getting sweeter and more ripe. 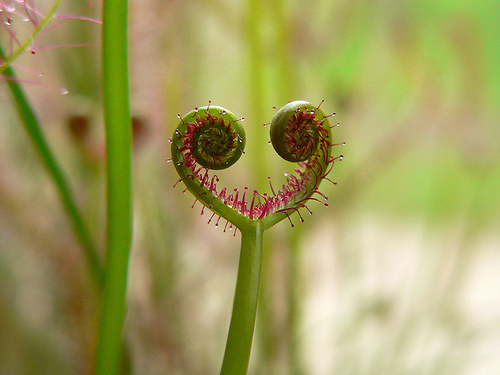 One day I had a feeling that it was time to delight in what the plant had to share. To keep the moment special I thought I’d wait to have some friends around. That evening I came home to find that a crow had gotten to the fruit first. It was disappointing, but that’s the truth. Things take time to mature, so give it time, but don’t take too long, or you’ll miss your chance. I’ve seen many flowers bloom and wither in my neighborhood. On my deck, that’s no exception. Flowers that bring color, sweetness and decorate a grey deck with life are all here for a short time. Once they’ve bloomed and bore fruit they wither away. It’s sad, but it’s the cycle of life. What’s important to remember though is that the roots of the plants are safely in the ground, and when the time comes, the flowers will bloom again. Same applies to love, friendships and everything else in life. Each has its own cycle, there are ups and downs, and even when something seems to be dying, if the bond is strong, it can withstand almost anything! Just because something seems to be ending doesn’t mean it will be gone forever.